Evening Sky, a photo by randubnick on Flickr. Last night we went to Obear Park to walk the dog. After 7:30 PM, dogs are allowed in Beverly's waterfront parks. It's a great little park, and it has the best views of the sunset in town, because you can look west and see the sunset reflected in the water.We arrived around 7:40, which is when I took this picture. The sun was heading toward the horizon and the sky and water were apricot and blue. Tonight I cropped the original photo to get this composition. 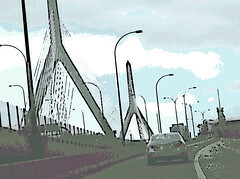 Heading into Boston (Digital Woodcut), a photo by randubnick on Flickr. This image began with a photo that I took yesterday on the way into Boston (heading to the MFA to see the Alex Katz exhibit). I had the luxury of being a passenger, so I got out my iPhone camera and tried to capture Boston. I love the Zakim Bridge, never get tired of it, and never get tired of trying to photograph it. In this shot, we are headed up the Leverett Connector with the bridge in sight . Tonight I took the original photo and used Painter 12 to posterize it and then apply the woodcut effect. I did a lot of fiddling with the controls and used the selection tools to try to get the effects to land where I wanted them to be. Then I did some more editing in iPhoto, quieting the colors a bit. I considered straightening the image out, but I like it as it is. 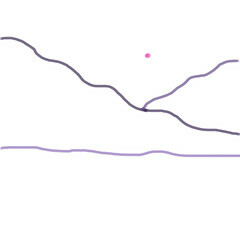 It captures the feeling of being following the rapid curves of Leverett Connector, careening towards Boston. 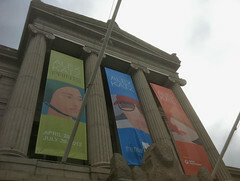 Alex Katz Banners at the MFA, a photo by randubnick on Flickr. I took this quick photo this afternoon on the way into Boston's Museum of Fine Arts to see the Alex Katz show. It was almost noon when my daughter called to say this was the last day of the show. This was something that we had talked about doing, but the closing date came as a surprise. It was too impractical to just scrap everything else and drive into Boston at the last minute. But that is precisely what we did. Chicken Collage Day 25 (July 28, 2012), a photo by randubnick on Flickr. Today I went to the studio and worked for a while on this collage, an image of a chicken made up of patterns. (The idea for this chicken was hatched while I was watching some real live chickens and admiring the patterns in their feathers.) Today I spent most of the time fitting tiny little pieces of black and white polka-dot pattern into the tail feathers. This part is excruciatingly slow because the remaining spaces are so small. And I also pasted in another row of white triangles above the wing. That part was very quick because the pieces are bigger and easier to handle. Many Pink and Blue Squares, a photo by randubnick on Flickr. Yesterday's post was a "digital print" made with Painter 12's pattern pen and a pattern that I created from one of my photos. (The original photo was of a square concrete and metal grid, posted here June 28, 2012). Today I decided to use yesterday's post and see what it would look like as another pattern. (So if you are following this logic, I am making a second pattern from an image I made with the original pattern.) Anyway. I used Painter 12 to "capture" yesterday's image as a pattern, and then used the paintbucket tool to fill a new image with that pattern. I fussed with it a bit to get the right size pattern, then I cropped and posterized it. I like the result, and might try to make things with it on Zazzle. Anyway, I decided to do this today because in a few minutes I plan to update Painter 12, and when I do that, I usually loose any patterns I have "captured" and have to recreate them (not hard, just annoying). 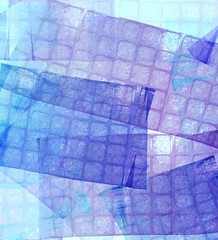 Pink and Blue Composition with Square Grid (Digital Print), a photo by randubnick on Flickr. Tonight I decided to make another image with my square grid pattern, which I created from a photo of a concrete and metal grate. (I posted the original photo here on June 28, 2012, and have done a lot with it since.) I "captured" a pattern from the image in Painter 12, and tonight I used a pattern pen and selected my square grid pattern. I hike the brush size way up and then just make a few strokes in different colors, and then I posterized the result. (These aren't really prints, but they kind of look like mono prints, and using that great big pattern pen reminds me of using an inked brayer.) It took many tries to get the strokes where I wanted them, and after than, I cropped the image at least six times to get to this composition. Sometimes you have to take more trouble with something simple if you want it to look good. When I began to feel peaceful about this image, I decided it was done. So here it is. 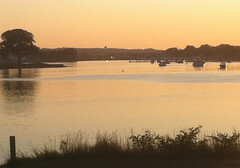 Liberty Marina in Danvers, a photo by randubnick on Flickr. Today it seemed like all my time was already spoken for when I woke up (it was), and I spent most of the day working against the clock to meet deadlines. But I did have an appointment to get my haircut which is always relaxing and a nice break. For some reason, there wasn't much traffic today so I arrived 15 minutes early. 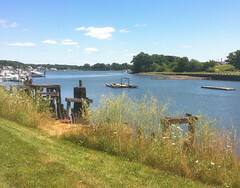 So I decided to use the time for a micro-vacation and check out the nearby marina (Liberty Marina in Danvers). The weather was great and I liked the view, so I took a few pictures. It was hard to get a good angle for the shot. Tonight I picked this one to edit in iPhoto and did some careful cropping to get a good composition. Boats on the Water (Digital Woodcut), a photo by randubnick on Flickr. 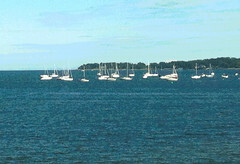 Here is one last version of my photo of boats on the water (at Independence Park, here in Beverly, MA). Last night I used Painter to apply a woodcut effect to the image. (That sounds simple, but I had to do several tries and fiddle with the controls to get the right amount of black to show up where I wanted it.) I also cropped it just a bit to get a little bit more balance in the composition. Boats on the Water (Posterized), a photo by randubnick on Flickr. 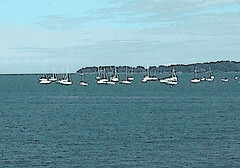 This is a posterized version of the image I published here last night, a picture of boats on the water (taken in early June at Independence Park here in Beverly, MA). I opened the original version in Painter tonight, adjusted the focus and contrast, and then posterized it. Somewhat better, or at least a little more interesting. What I really like is the composition; I also cropped it just a bit in iPhoto and I think that helped a bit. Tonight I also used the image to create a digital woodcut, which I plan to post here tomorrow. Boats on the Water (Independence Park), a photo by randubnick on Flickr. 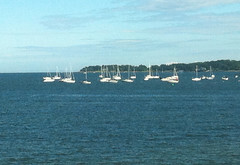 This is something simple, just a photo I took in early June, of boats on the water at Independence Park, here in Beverly, MA. The boats looked very peaceful, so I took a picture. I used the zoom on my iPhone camera. I captured the composition, but the image isn't as clear as I would like it to be. I could certainly paint from this image, even as it is. But I am thinking that later this week, I might try to see what I can do with the image in Painter. Bright Circles Lines Rectangles, a photo by randubnick on Flickr. This is another little digital image that I made with the Brushes app on my iPhone. (I made this image while I was in a waiting room, waiting for an appointment at the doctor's.) This image is very similar to one that I posted just a few days ago (on July 17). I made this one the same way, but with a brighter color palette. (As with the other version, I kept the original iPhone format because I may try to make an iPhone case with this design on Zazzle.) 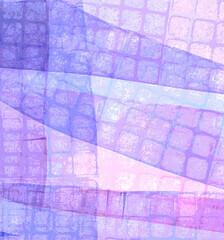 I was interested in the overlapping shapes and transparent layers of color. I am using this image to send happy birthday wishes to several family members with overlapping birthdays. For Colorado, a photo by randubnick on Flickr. Thinking of my home state tonight. After the Storm, a photo by randubnick on Flickr. Here north of Boston, yesterday we had big loud thunderstorms and heavy downpours starting in the afternoon. But by 4 PM, it had cleared up, so the trip to the author's expo at the Danver's Yacht Club was back on. Afterwards, we walked around outside. I liked the line of tall grasses setting off the rest of the scene, so I took some pictures. I think this is the best one. 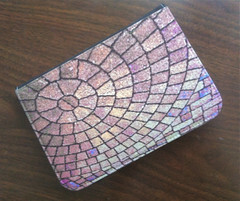 Kindle Case with Stone Spiral Design, a photo by randubnick on Flickr. Circles Squares Lines, a photo by randubnick on Flickr. Tonight I made this digital drawing using the Brushes app on my iPhone. I used four different digital brushes to get the geometric patterns. I might usually consider cropping the image to get a more traditional format. 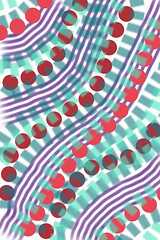 However, I am thinking I might be able to use this pattern to make an iPhone case on Zazzle, so I left it alone. Because I used Brushes on my iPhone instead of my iPad, there's no stroke-by-stroke video for this one. 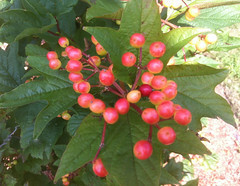 Ripening Berries (Mapleleaf Vibernum), a photo by randubnick on Flickr. This morning we stopped at the Starbucks to get a coffee and took a very brief walk with the dog in the tiny park beside the Bass River. This was a nice little break at the beginning of a hectic day. I stopped to take a picture of a some beautiful berries. Tonight I tried to find out what they are by searching images on Google. I thought they were bunchberries, but the leaf shape looked wrong. But when I put "maple leaf" and "red berries" into the search engine, I got some matching images for Mapleleaf Verbenum. 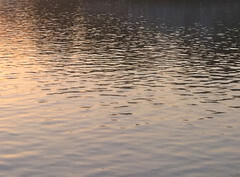 Tonight I used iPhoto to do a little retouching and then cropped the image to get this composition. Crazy Daisies (Digital Sketch), a photo by randubnick on Flickr. Life has been too busy and my schedule has been crazy. But I will be crazy too if I don't make art. So tonight I decided to do a quick digital sketch with Painter 12, working from my imagination. 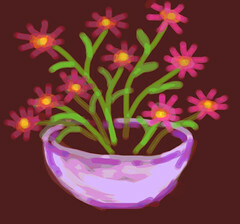 These are just some crazy little daisies drawn with digital pastel on a dark brown background. I worked on this for about an hour. I am still struggling to get the hand of drawing with a track pad, instead of a mouse. When I was about done, I tried posterizing the sketch and it made the colors pop, and I liked it. These crazy little daisies make me smile. Ripples in the Water at Sunset, a photo by randubnick on Flickr. This is another photo taken at Obear Park, here in Beverly, MA, as the sun was setting. I was interested in the patterns made by ripples in the water, so I took this photo. This image is very close to the way it came out of my iPhone camera, but I used iPhoto to lighten the shadows just a hair, and then cropped the image just a bit at the top. 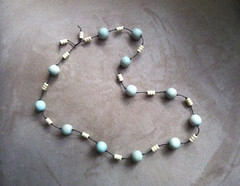 Necklace with Wood Beads in Blue and Blond, a photo by randubnick on Flickr. 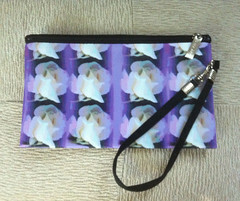 Wrist Purse with "Nine White Roses"
Wrist Purse with "Nine White Roses", a photo by randubnick on Flickr. Quiet Sunset at Obear Park, a photo by randubnick on Flickr. Tonight we went to Obear Park here in Beverly, MA. We took the dog, so we waited till after 7:30 pm because in the summer, that's when dogs are allowed dogs aren't allowed at BE when dogs at Beverly's waterfront parks. The sun was low in the sky, and we took our time, hoping for a nice sunset. When the colors began to change, I started taking pictures. This one was one of the best, and just took a little bit of straightening and adjusting in iPhoto. I have seen more spectacular sunsets (many of them at Obear Park), but this one was quiet and very peaceful, which is what I was hoping to capture. Composition with Branches, Clouds, and Sky, a photo by randubnick on Flickr. The other day, I was trying out a new lawn chair in the back yard--not so much a test-drive as a safety inspection. The chair was in a reclining position, so this was my view, and it dawned on me that I was admiring it, so I took some pictures. When I was a kid, I liked to lie down on the ground and look up at the sky. And I still love a view of the sky through the trees. This is one of the best photos, and tonight I used iPhoto to adjust the shadows. 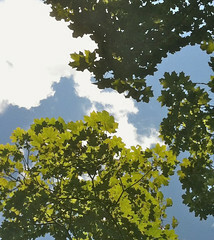 Then I cropped the photo, working carefully and trying to showcase the way the shapes of the foliage mirror the shapes of the clouds and blue sky. 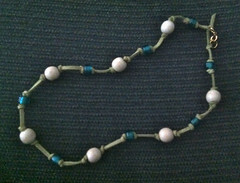 Necklace with Wood and Blue Glass on Green Suede Cord, a photo by randubnick on Flickr. The washing machine broke over the weekend, and the repairman came this morning. I knew I wouldn't be able to accomplish very much while the washing machine was being fixed, just too much noise and too many distractions. So I decided to try to put this necklace together. I already had the basic idea because I had been thinking about this combination for a while: wooden spheres and teal glass beads on a knotted green suede cord. Because I was securing the beads by tying knots, I knew it would be easy to stop at any point if I was interrupted. But I wasn't! It enjoyed myself, and when I was finished, the washing machine was already fixed. 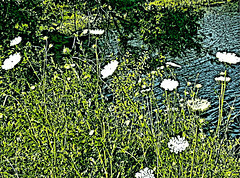 Queen Anne's Lace (Digital Woodcut), a photo by randubnick on Flickr. This image began with another photo taken near the Bass River, here in Beverly, MA. There is a tiny park and path along the river right behind the Starbucks, which is one reason for my frequent visits. The other day, I noticed some Queen Anne's lace with the river in the background, so I took some pictures. The sun was very bright and the focus wasn't as sharp as I wanted, but I was very happy with the composition. So tonight I opened the photo in Painter 12, adjusted the brightness, sharpened the focus, and then applied the woodcut effect. After that, I did some more editing in iPhoto, mainly adjusting contrast and color. There is something about flowers growing at the water's edge that seems peaceful to me. Daylilies on Riverbank (Digitally Modified and Posterized), a photo by randubnick on Flickr. 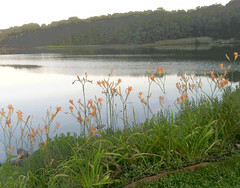 Here's one more look at those daylilies on the riverbank, just before the sun went down. 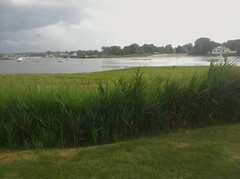 (This was taken near the Bass River from the little path behind the Starbucks, here in Beverly, MA.) 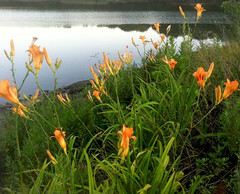 I loved the way the lilies looked on the riverbank, so I took this picture. When I got the image into my computer, I saw lots of problems in the foreground, which I tried to solve in Painter 12 with some digital slight-of-hand. Then I did some selective posterizing. Although I am not completely satisfied with the result, I love the feeling of this image. So I decided to accept this image as it is, put perfectionism aside, and share this peaceful moment. Daylilies and River, a photo by randubnick on Flickr. This is another photo that I took near the Bass River at the little riverbank walkway behind the Starbucks here in Beverly, MA. It was nearly sunset (the "golden hour"), and the daylilies looked great in that light, so I took a few pictures. I was pretty happy with this one, but when I opened the image in the computer, I could see some litter (maybe a candy wrapper) in exactly the wrong place. So I opened the image in Painter 12 and used some cut and paste to get rid of the problem. Then I did some selective posterizing. I wanted to cover my tracks and to bring out the color of the daylilies, but I didn't want to add posterizing effect to the water. Sunset Reflections, a photo by randubnick on Flickr. 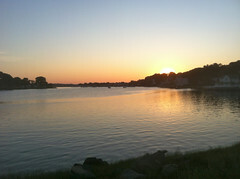 This is a view of the sky at sunset over the Bass River, here in Beverly, MA. To be more specific, this is the view from the little parking lot and walkway behind the Starbucks near the river. We stopped to get a coffee just before sunset. 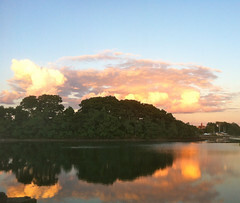 The amazing colors of the sky were reflected in the water, so I began to take pictures. This photo was one of the best. Tonight I used iPhoto to lighten some shadows and do a little retouching to get some distracting weeds out of the way. Then I cropped it to get this composition. Waiting for Fireworks (Beverly Marina), a photo by randubnick on Flickr. Tonight's adventure was a trip to the Beverly Marina to watch the fireworks. I had never done this before, and in fact, had never walked around the marina, but my daughter led the way. We arrived shortly before dark, and it was beautiful! This is a great vantage point to see fireworks being set off in Salem, Marblehead, Danvers, etc. I made many attempts to take pictures of the fireworks, but wasn't optimistic about the results. (I have tried photographing fireworks before.) We also saw lightening and heard thunder, and we left when it began to rain in earnest. When I got home and transferred my photos into the computer, I saw that I did seem to have an enormous number of failed attempts to photograph fireworks. (Some may have potential, so I plan to look at them more carefully tomorrow.) But I did have some nice photos of the marina. 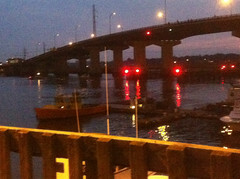 This is one of the best, a view of the bridge to Salem, seen from the marina. This is how it looked right out of my iPhone camera. Chicken Collage Day 24 (July 3, 2012), a photo by randubnick on Flickr. 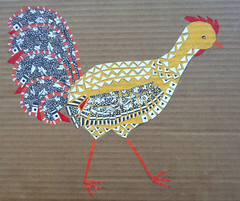 This afternoon, I went to the studio for a while and worked for about an hour on this project, my chicken collage. 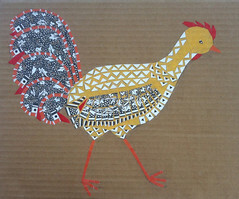 I am using pasted paper to create an image of a chicken made up of patterns. This idea suddenly came to while I was looking at the chickens at Long Hill Gardens, here in Beverly, MA. There were lots of different kinds of chickens there, and lots of beautiful patterns in their feathers. Well, this project is taking a long time, but for me, that is always true of collage. Creating the image is fun, and at the beginning the work goes quickly, but there is a lot of slow and painstaking work to implement the idea and finish it. Today I made the focus of my work filling in gaps in the tail feathers with tiny pieces of black and white polka dot pattern. This went slowly, but I can see some progress. And as always, working on this little chicken makes me smile. Composition 2 with Square Grate Pattern, a photo by randubnick on Flickr. 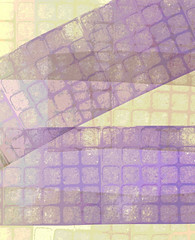 Last night I created an image with my square grate pattern, using Painter 12's pattern pen. I had so much fun that I decided to do another one. I am trying to take colors that were in the original photo. On this one, I did some selective posterizing to bring out the pattern. Composition with Square Grate (Digital "Print"), a photo by randubnick on Flickr. The images I have been posted for the past few days all began with a photo of a square metal grate that I noticed while I was sitting on a park bench. 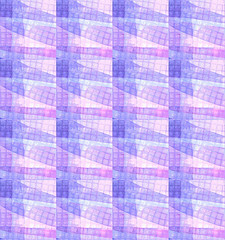 Yesterday I used Painter 12 to make the image into a pattern (which I am already using to make things like cases for electronic gear on Zazzle.com). 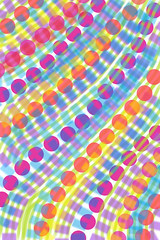 Tonight I decided to load the pattern into Painter's pattern pen, and created this "digital print". (It isn't really a print, but these images remind me of mono prints, so that's what I call them.) I use a big "brush" loaded with the pattern, and get the strokes where I want them (not easy!) and then posterize the result. That's a big simplification, but it's the basic idea. Using the pattern pen like this reminds me of running an inked brayer over paper. Anyway, I liked the result, and here it is.